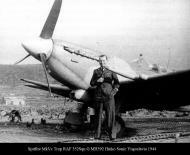 Supermarine Spitfire Mark VCs of No. 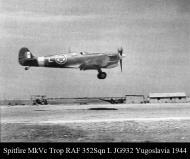 352 Squadron, the first operational Yugoslav unit to be formed in the RAF, being prepared at Canne, Italy, for their first operation, escorting a fighter bomber attack on targets in Yugoslavia. 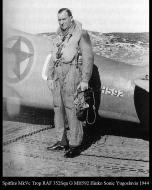 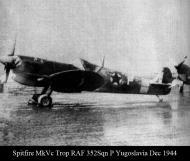 Note the Yugoslav national markings on the aircraft, consisting of a red star superimposed on the centre of the RAF roundel and on the central white portion of the tail stripe. 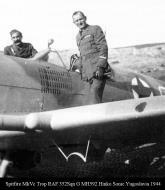 Watched by his rigger (left), a pilot of No. 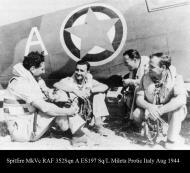 352 Squadron, the first operational Yugoslav unit in the RAF, signs the aircraft serviceability form for his Supermarine Spitfire Mark VC on the tailplane of the aircraft, before taking off on the unit's first operation. 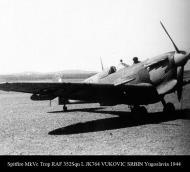 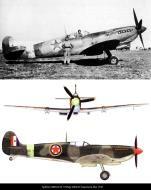 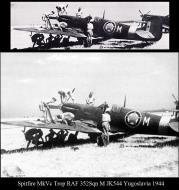 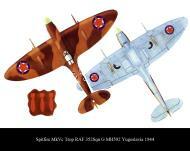 Note the Yugoslav national marking, consisting of a red star superimposed on the white portion of RAF tail stripe.